This is the second stop on the self-guided tour of the Hofburg palace interiors, after the Silberkammer. Sisi is the nickname of Empress Elisabeth, iconic wife of Emperor Franz Joseph, and the face that launched a thousand commemorative mugs, books, postcards and films. The museum looks to give you some insight into her life, loves and obsessions. In doing so, it’s not a shrine to the fairy-tale princess of myth. Nor is it a dry historical record. 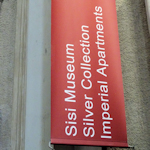 In fact, the museum treads a middle path – Sisi fans and Sisi skeptics alike will find much to enjoy. At the end I knew a lot more about the Empress, but still didn’t know who she was. Which I think is the point. She’s an enigma, a strange mix of romantic innocent and melancholic misanthrope. Vain yet withdrawn. Living life to the full, yet always unfulfilled. Unhappy and buffeted by the dark hand of fate, but hardly a tragic heroine. I’d have liked to look into her eyes to see the true soul within. Like the rest of the tour, all the information presented is in German and English, and the audio guide is very informative: it provides an important overview and chronology you might not get from the visual info alone, and actors recite quotes from Sisi and her poetry. Such quotes also decorate some of the walls of the museum, adding emotional context to the displays. These displays trace Sisi’s life from her Bavarian childhood around the 1840s through to her assassination in Geneva in 1898, illustrating this biography with clothes, jewellery, letters, household items and more. The first display is actually before you go in – three “Sisi” wigs, plus a series of posters across the room that offer a potted biography, each accompanied by a contemporary portrait. Immediately after the entrance is a large model of the Hofburg area from around 1915, including those buildings planned, but never built. You get a real feel for the scale and majesty of the complex. Then the museum proper starts and you are introduced to the legacy and legend that is Sisi. This legend is illustrated with, for example, film clips, statues, newspaper excerpts and various commemorative memorabilia that documented (and created) the myth that grew up around the Empress, largely after her death. The cult of Sisi made good propaganda for the monarchy, of course, and businesses saw an opportunity to commercialise her image (take a brief peek into the shop at the end of the tour for modern-day examples!). The museum warns you that the truth about Sisi is a little different. Then you’re taken through Sisi’s actual history, beginning with her unaffected childhood – astonishingly, you can even see one of her milk teeth – and moving on through her marriage, lifestyle, travels and eventual death. The journey reveals much of the Sisi character and obsessions – the distaste for court etiquette and responsibility, the love of riding (she was perhaps the best female rider in Europe), the dedication to her health, hair and looks, the need to travel as a permanent search for distraction, the melancholy, her poetry, her high regard for the Hungarian people, etc. The famous 1865 “star dress” portrait painting by Franz Xaver Winterhalter. A replica of the coronation robes she wore when crowned as Queen of Hungary in 1867 and her gown from the farewell ball in Munich (held before she left for Vienna). Her medicine chest (which contained cocaine, then valued for its clinical properties). The original recipes for cosmetics she tried out. A full reconstruction of the saloon car put at her disposal by the railways. The museum is not huge, and quickly leads into the final stop on the Hofburg experience: the Kaiserappartements (Imperial apartments). Here you learn more about Sisi’s character through her actual living quarters.